Jakarta, May 11th 2015 – Further increasing its presence in Central Java, Archipelago International has recently opened its 4th hotel in the city of Semarang. Becoming the 35th favehotel in Indonesia and the 1st favehotel in Semarang, the new favehotel Diponegoro Semarang joins Archipelago International's Quest Semarang, NEO Candi and Aston Semarang. “In line with the increasing middle class population in Indonesia, as well as mushrooming low-cost airlines, more people are holidaying away from their hometowns and doing business as budget travelers. Semarang is a popular destination for just this, together with a high number of domestic travelers stopping en-route between Jakarta and Surabaya. 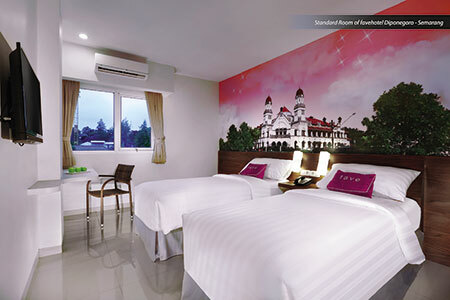 favehotel Diponegoro Semarang will cater perfectly to the area's value-conscious guests who are after a comfortable stay at an affordable price in this convenient location.“ Said Ms. Tenaiya Brookfield, Vice President of Sales and Marketing at Archipelago International.